Today was such a success, that I just cannot see not expanding it. Thanks so much to Janet for helping me find my way! Times are hard right now. The economy where I live is not getting even close to better. Jobs are sparse and money for food is even more so. This morning when I was spending $3 on papers and then when I was clipping the coupons out, I just did not like the fact that there were so many coupons in the paper I was not using. Therefore, the birth of "The Great Coupon Exchange" began. 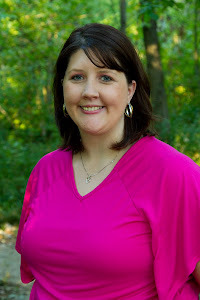 Are you a mother of college aged children and find that you keep having tons of diaper and baby food coupons? Please know that as a young mother of young children, those precious coupons are precious pennies in our pockets. Do you have extra coupons that your not using and just hate going to waste? Every Sunday, I will be posting all my extra coupons and at the end I will adding a MckLinky for you all to share what you have. Just write a post mentioning the Exchange, come back to One Blessed Mama, link up and start looking to see if there are any coupons you might need. So be ready friends with your newspaper and scissors in hand (but please be careful! :)) next Sunday. 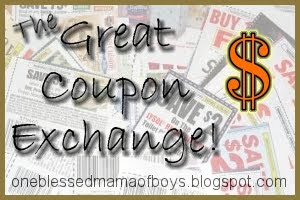 Come back and join me for the 2nd edition of The Great Coupon Exchange! Oh wow, at first I couldn't find the comment to leave a button and it was so obvious, lol. This is a great idea! I have to admit I clip coupons but don't use them as often as I should.